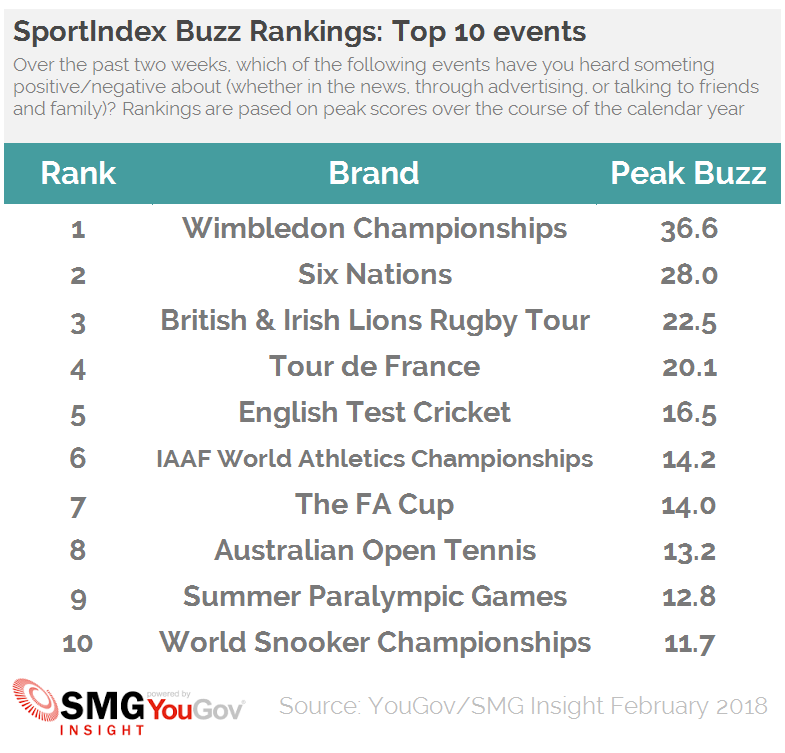 February 26, 2018, 2:08 p.m.
Rugby events occupy two of the top three places of the SMG Insight/YouGov SportsIndex Buzz rankings for 2017. Wimbledon - a perennial high achiever - tops a table which also shows strong performances from the Tour de France and the England Test Cricket side. But it is rugby’s show of force, following strong domestic performances in the Six Nations Tournament and the British and Irish Lions tour, which catches the eye. Both events feature in the top three. SMG Insight/YouGov’s SportsIndex monitors the public’s perceptions of 60 sports properties – as diverse as The FA Cup and the NFL – every day. Buzz is one of the 16 metrics recorded and asks whether people have heard anything good or bad about a sports event or league in the previous two weeks. The 2017 Buzz rankings are based on peak scores over the course of the calendar year (taken as a four-week rolling average). The presence of the Tour de France in the top ten is arguably the biggest surprise of 2017. Although ‘La Grande Boucle’ was amongst our top properties of 2016, it had climbed there from almost the bottom of the rankings from the year before. Its continued presence indicates that it may now have cemented its place in the top echelons of sporting events, having been won by a British athlete in five of the past six years. Whilst the World Snooker Championship’s ascent into the top ten has been more steady, it has been just as relentless. Having taken over the sport in 2010, Barry Hearn has led it back into the consciousness of the British public, with the climax of the sport- the World Snooker Championship - climbing seven spots this year. 2017 was also a vintage year for horseracing. With broadcast rights having recently been acquired by ITV, racing events are the three biggest winners in the rankings for the year (see the chart below). 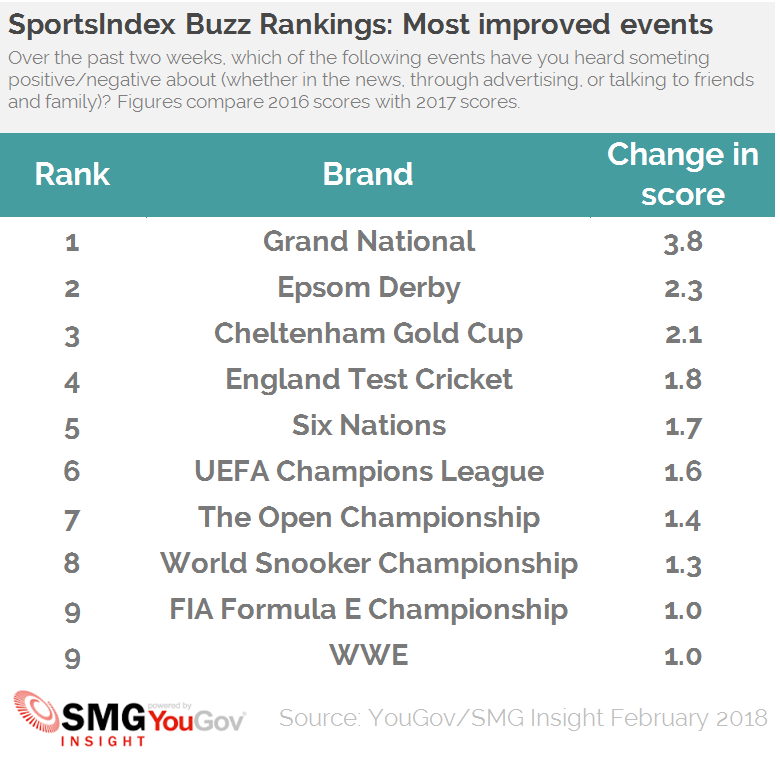 The Grand National, the Epsom Derby and the Cheltenham Gold Cup all showed significant increases in the amount of Buzz they generated amongst the public. Racing has stepped up its marketing efforts in recent years and 2017’s increases in Buzz appear to be the reward. Despite a challenging winter in Australia, the England Test Cricket side was one of the biggest improvers in 2017, something which has also propelled the team into the top five overall. That’s thanks largely to a successful summer on home turf which saw wins against South Africa and the West Indies, fuelling positive chatter. The FA Cup is the only football property to feature in the top ten this year, showing how fierce the competition for conversation is. The Cup climbed three places. Our only negative scorer from 2016, the FIFA World Cup, also made it into positive digits this year, with a peak Buzz score of 1.9%, up 6.7% on its previous showing. Click to download the full SportsIndex Buzz Report, which covers 60 sports properties and includes a review of longer term trends, as well as further analysis.